M1 Machining is proud to announce the release of M1-80% AR-10 DPMS Lower Receiver. The M1 Machining .308 DPMS 80% lower receiver is precision 3-D machined from solid Aerospace Billet 7075-T6 Aluminum to Military spec tolerances, finish options are; bead blast finished and Mil 8625 Type III. All that is left to do is machine the fire control pocket, the trigger group and drill a few holes. Once complete you will have a fully functional M1 Machining .308 DPMS pattern lower receiver for .308 / 7.62x51 NATO, compatible with DPMS platform upper receivers, Magpul, SR-25 & DPMS LR-308 Magazines. This is a top-tier AR-10 80% lower receiver perfect for any high quality AR-10 build. 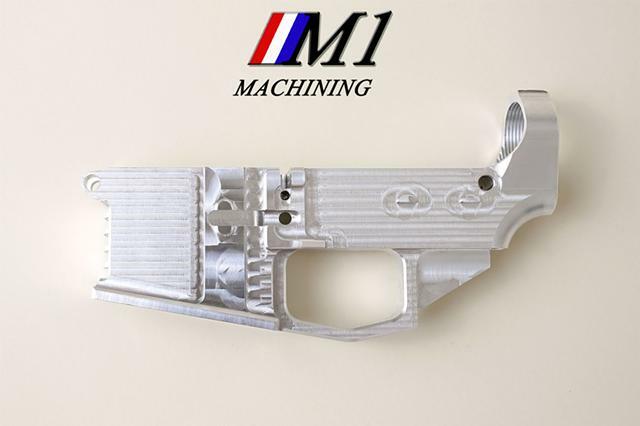 M1 Machining is proud to announce the release of M1-80% AR-15 Lower Receiver. The M1 Machining .223/5.56 NATO 80% lower receiver is precision 3-D machined from solid Aerospace Billet 7075-T6 Aluminum to Military spec tolerances, finish options are; bead blast finished and Mil 8625 Type III. All that is left to do is machine the fire control pocket, the trigger group and drill a few holes. Once complete you will have a fully functional M1 Machining .223/5.56 NATO lower receiver compatible with DPMS platform upper receivers. This is a top-tier AR-15 80% lower receiver perfect for any high quality AR-15 build. • Flared magwell to improve mag changes. • NO FFL is required for purchase, item can be shipped directly to your home. • As determined by the firearms technology branch of the ATF, this lower receiver is not classified as a “firearm” as defined by the GCA of 1968. Because 80% Lowers are not considered firearms by the ATF, we can ship them right to your front door with no FFL required... but finished rifles must meet all applicable laws and you must be able to legally own a firearm. Compliance with all laws is YOUR responsibility. All sales are subject to our Returns and Cancellation Policy. *Contact us for orders of 20 or more units.